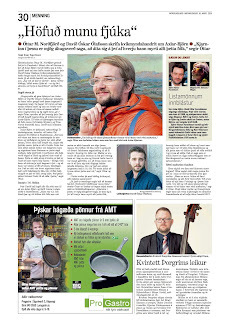 I did an interview in Morgunblaðið about one of the screenplays I'm currently working on. It's about Iceland's only serial killer, called Axlar-Björn, a 16th Century axe murderer! I'm super excited about this project and that the Icelandic Film Center has given the director, Davíð Óskar Ólafsson, and myself the first writing grant (out of three) to bring this remarkable story to the screen. Here's a short article in English about Axlar-Björn.